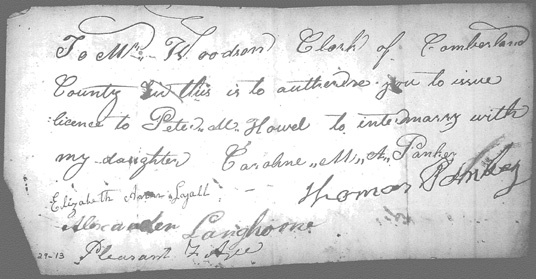 I have long know of the marriage of Peter M. Howell to Caroline M. A. Pankey. Ancestry.Com Virginia Marriages has reference to it. I also recently encountered a book, Marriage Records 1749-1840 Cumberland County Virginia compiled by Katherine B Elliott, at the Georgia Room at the Cobb County Public Library. It too is an index but had more information than the Ancestry.Com index had. So, I wondered what else might be in the actual records. Besides which, it would be wonderful to upgrade the quality of my sources from two and three stars to four stars with copies of actual documents. The Cumberland County Courthouse indicated that I should contact you. 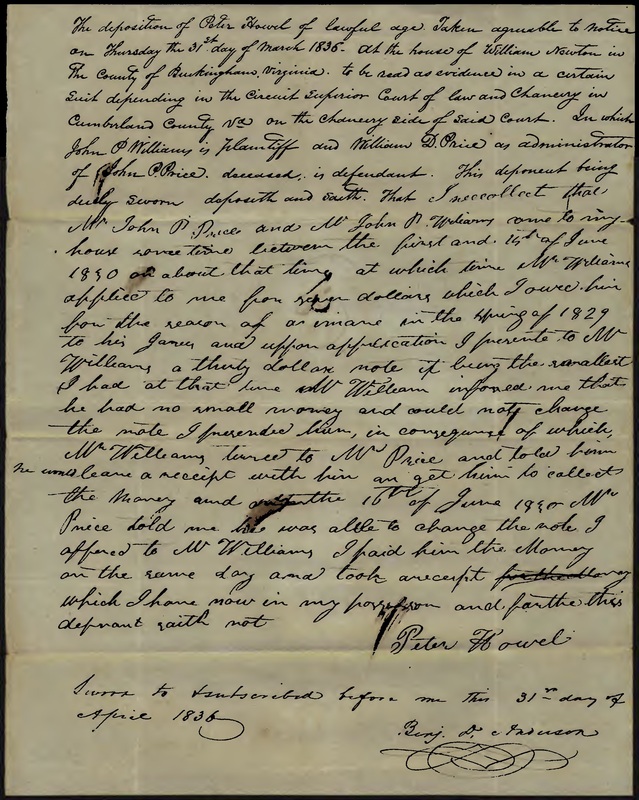 I am looking for any documents regarding the marriage of Peter M. Howell and Caroline M.A. 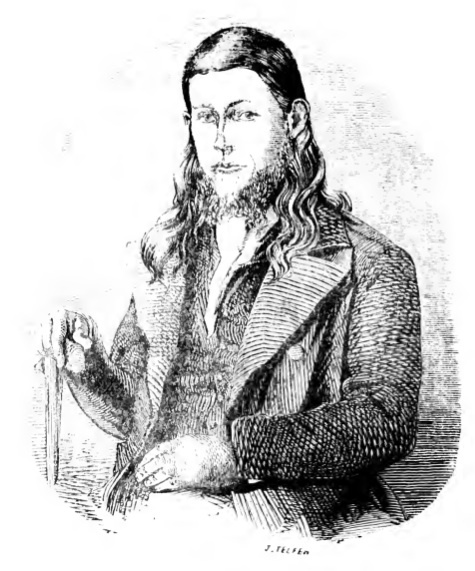 Pankey, 11 June 1829 in Cumberland County. Marriage Bonds, 1822-1830, No index. 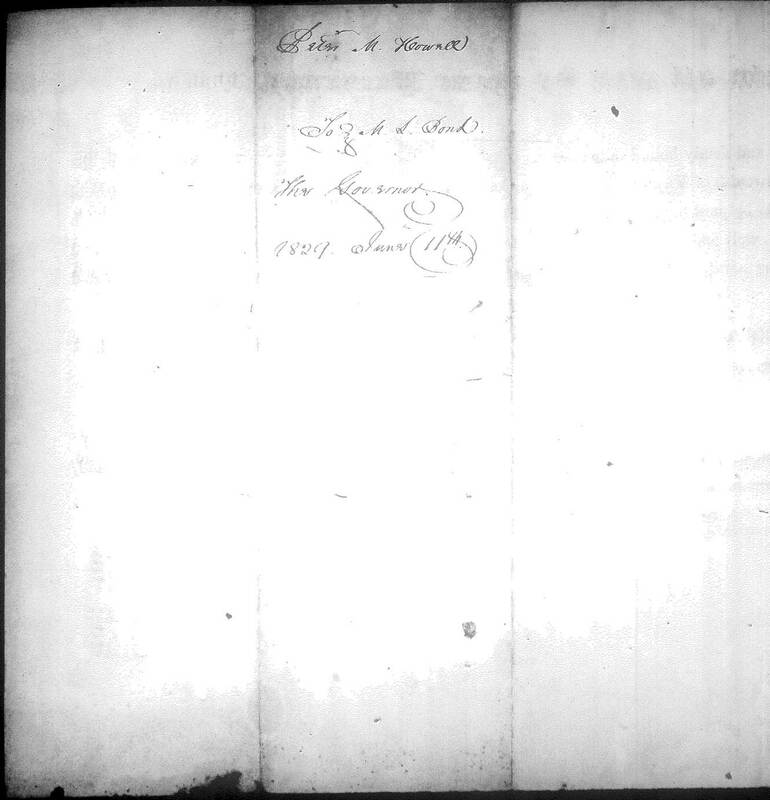 Abstracts of Marriage Bonds, 1749-1853 – Females (D-V), unpaged. 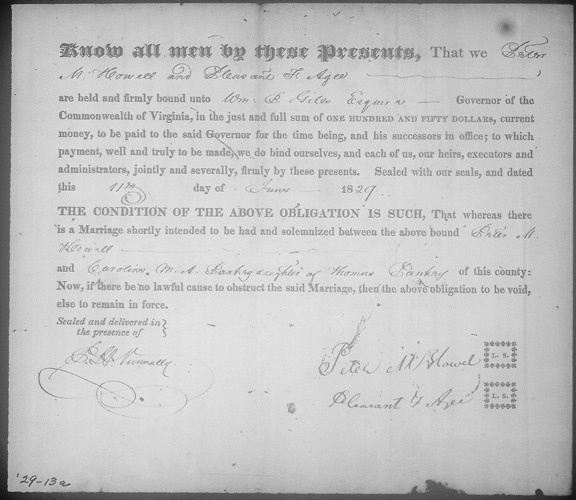 Abstracts of Marriage Bonds, 1749-1853 – Males (P-Z), unpaged. Well, the Abstract of marriage bonds for Males is the wrong microfilm for Peter M. Howell and I had an abstract already. But the Marriage Bonds, Reel 42 looked fantastic; just what I want to see. I printed out the information and headed to my local library and submitted an interlibrary loan request. The folks there didn’t think it would be accepted as they hadn’t ordered reference microfilm via interlibrary loan before but they would try. A couple weeks later the library called, they had finally contacted the Library of Virginia and learned how to order it. Another week or so later the microfilm arrived. I tried looking at it on my local library’s reader, however, the image adjustment wasn’t working. I was extremely pleased that they allowed me to take the microfilm out to the Family History Center. I went there. The wonderful folks there helped me get set up view the film and to be able to print to JPG. I started looking; no index meant slow going, then I found a date marker, 1823. I zoomed ahead to the 1829 marker and began reading. About 50 pages into 1829 I found the information I was looking for. 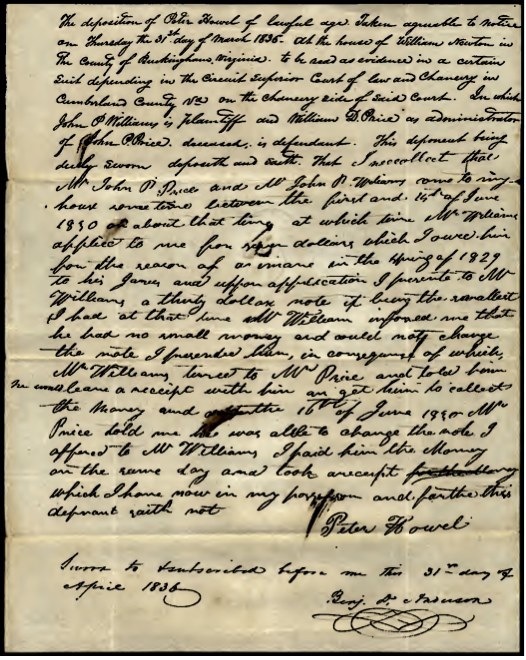 First a permission to marry note, both sides of an envelope that probably held the money for the bond, and the marriage bond. Know all men by these presents, that we Peter M. Howell and Pleasant F. Agee are held and firmly bound unto Wm. B. Giles Esquire, Governor of the Commonwealth of Virginia, in the just and full sum of One Hundred and Fifty dollars, current money, to be paid to the said Governor for the time being, and his successors in office: to which payment, well and truly to be made, we do bind ourselves, and each of us, our heirs, executors and administrators, jointly and severally, firmly by these presents. 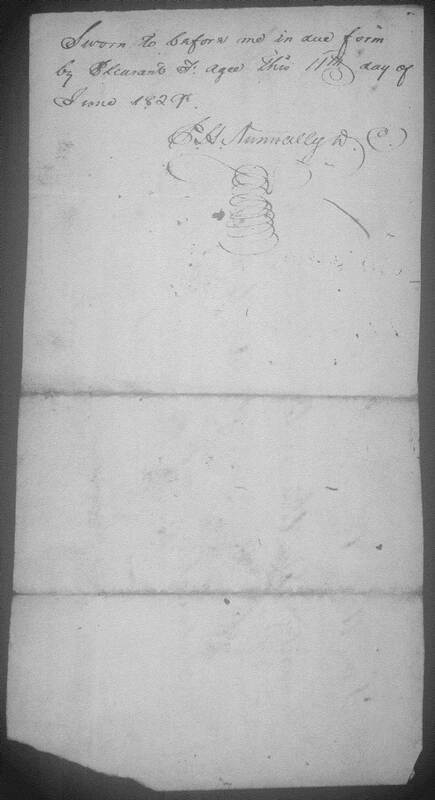 Sealed with our seals, and dated this 11th day of June 18 29. Now, if there be no lawful cause to obstruct the said Marriage, then the above obligation to be void, else to remain in force. Thanks to The Library of Virginia; they are an awesome resource and are on my list of preferred sources.